Belthangady, Dec 04, 2017 : Educated Dalit couple hailing from Ujire, were formerly employed with a multi-national company and stayed at a flat in the city, has now been living in a tarpaulin hut. All was well until a debacle in the family turned their lives upside down. Though the couple, who is now struggling for one-square-meal a day, applied for housing under the Ashraya scheme several months ago, nothing concrete seems to have happened on ground. Asha and Vijay, in their 30s, are degree holders. Destiny brought them together at a multinational firm in Mangaluru. Vijay was a manager where Asha, then stranger to him, joined as an employee. Cupid struck between the two and they entered wedlock. They moved in to a rented flat. In course of time, the couple was blessed with two sons. Just when everything seemed perfect, workload allegedly took a toll on Vijay and he became a victim of mental disorder. As his employer realised the case, he was shown the doors. On the other hand, Asha, too, had to quit her job. As their future looked bleak, the couple shifted back to Asha’s ancestral house in Ujire. Though Asha, whose parents are no more, inherits some property, it is disputed. To make things worse, her relatives allegedly assaulted Vijay and kicked them out of the house. As the matter reached the police station, the couple was forced to leave the ancestral house. With no place to live and no money to afford a rented accommodation, the couple were on the streets. 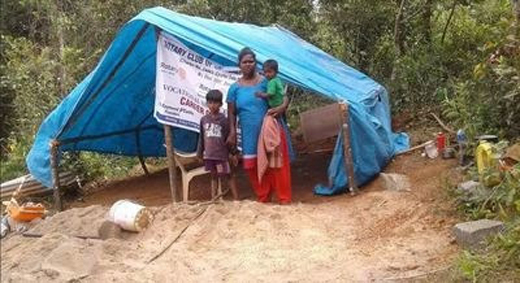 Rotary Club Mangalore Central then helped them set up a tent-like structure using a tarpaulin and a solar unit good enough to light a lamp and charge a mobile. Asha and her family have been spending their days under this tarpaulin since the last few days.